Does your spare tire carrier sound like a machine gun going over bumps, or an angry woodpecker banging on the back window? 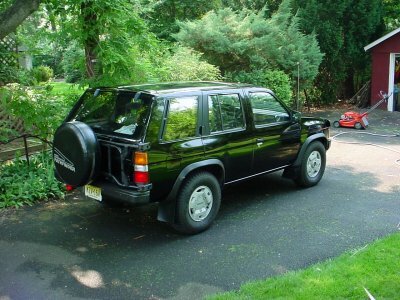 At 225,000 miles, my 91’s spare tire carrier sounded just like that. 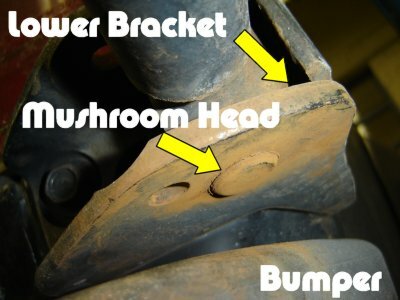 The hinge bushings made noise going over bumps. The hinge pins also were very tight, no matter how much I had poured oil over them. Road salt, and a “real” size spare tire had lead to this sad event. So In the winter of 2005 I decided to do something about it. Here is a short video (with sound) of what they sounded like going over bumps. My hand is on the top of the tire moving it back and fourth. You may want to look at this page on how to adjust it…. Safety rules apply, don't blame me if you get hurt or scratch your ride. 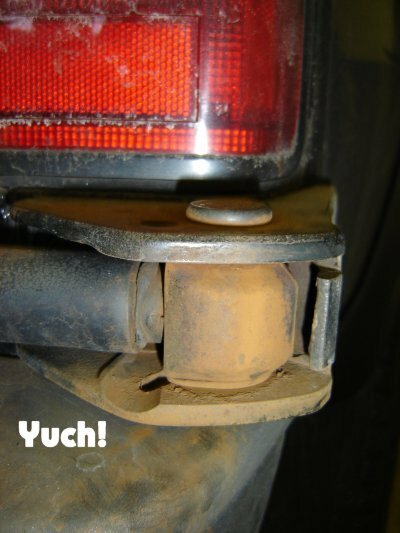 What you’ll need - A trip to the Nissan dealer - you will need 2 Pins (P/N E7245-41G60) and 4 Bushings (P/N E7247-416G0) - Don’t believe the Nissan parts guy - the listing for my 91 showed only 2 bushings total, not 4. I ended up making two trips - my own fault for not knowing more than him! Tools - No sissy stuff here. You’ll need a good air or electric grinder, hammers, some metric sockets, a few punches, and some quality grease. 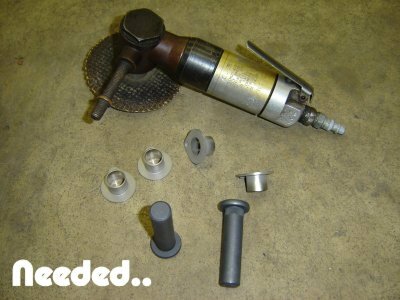 You may also wish to have a good drill (or drill press) with a ½” carbide or tungsten bit, and an air chisel. Oh, and you’ll need a helper for a few seconds during the job. Time - This should *should* only take about an hour, mine took longer, I’ll go into detail later about my horror. 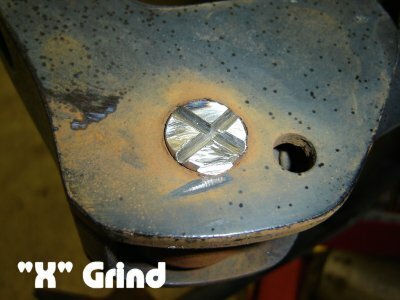 Process - Remove carrier, grind or drill out pins, pound out bushings, install and grease new hardware. Put it back together. Space - You’ll need a workbench to place the entire carrier on. I had to (and I suspect you will to) remove the carrier to get the bottom pin out. It didn’t clear the bumper. Plus, looking back on it, I’d not want to hit this as hard as I had to while its on the truck.. 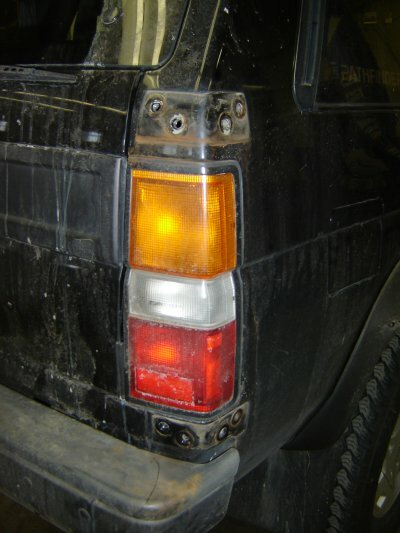 Step 3 - Loosen the bottom bolts first on the rear of the truck, then loosen the upper ones. Step 4 - Remove one of each bolt, be careful. Step 5 - Get someone to help you, and have them support the weight of the tire carrier as you remove the lower bolt, and then the upper bolt. Be careful, the carrier is heavier than it looks on the end that bolts to the body. Don’t let it smash or scratch the body. Step 6 - Remove the carrier. Ewwwww, look at the dirt! I was amazed at how much crud was back there. No rust, just crud. Might be a good idea to clean it off. Step 7 - I started with the mushroom ends - I used my grinder to make an “X” in the head, and then feather it off. I did (and you will) have to grind into the bracket (just a hair). Keep track of which side is up. You CAN reinstall the brackets upside-down or get them mixed up. Do one at a time. Step 8 - Once it ground down, use a punch, or air chisel and pound out the old pin. 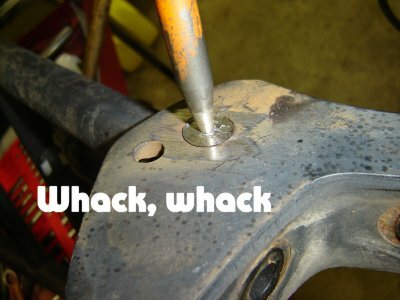 Step 9 - Use the punch again and pound out the old bushings. 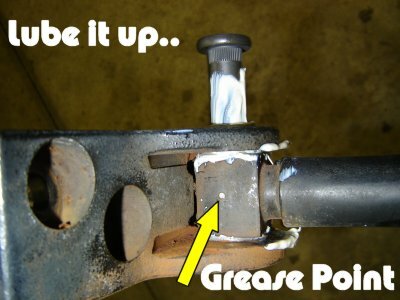 Step 10 - I added grease to the bushings and the new pin, and installed them, pay attention to the tabs on the bushings. Tap them in *gently* with a hammer. I broke the head off of one when I was hitting it. Not a big deal, I think they are brittle. It’s a tight fit. Note the grease point, make sure its clear - later down the road this is where grease (with a pin style injector) can be injected into the joint. So 1 of the pins came out fine, and it went back together fine. The other pin was possessed by Satan, and refused to come out. I ground it. No matter how hard I pounded, it didn’t budge. So I used the air chisel. A Snap On, not a wimpy one.. No movement just made a hole in the pin. So I heated it with a torch, - a real oxy cutting torch. Got the pin bright orange, hit it - STILL didn’t come out. Heated it again, used the air chisel, still didn’t come out. Let it cool, and wow - now it real tight. Screw it, it’s coming out. 25 Ton arbor press - pressed it with the other pin I had popped out, moved a little then distorted the pin into a letter “S” shape. Damn! Press was leaking oil. Decided to use an OTC Ball Joint press - The press flexed. No pin movement. Drilled out the pin, about 1-1/2” deep with a ½” bit - slow pressure - kept squirting motor oil onto the pin. Thus, if you can’t get it out by hitting it a few times, drill it deep and wide, and then hit it again.